Kid Koala, Raja, Blackstreet, Chet Faker, Flying Lotus and more. 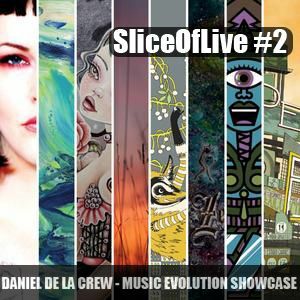 Today no clouds in the sky,this week was really illuminating thanks the meeting with pure and strong souls,yesterday night there was a sparkling mood floats around in the air...now we have another &apos;Sliced&apos; mix from MusicEvolution&apos;ShowCase!!!!!!!!! My friend Tiziano is going to go in London to be MusicEvolution&apos;s Ambassador at the Dingwalls&apos;Event in Camden Town and I have recorded something from the last showcase,that was really eclectic and powerfull!!! You can listen a lot of differentt Aromas...in fact i have some problems to tag that podcast,however here you can walk,run and dance into an hyper-colored music-route. So,we waitin&apos; every kind of newz from London....meanwhile you can see this Cool-Sound-Picture.....Evolving!!!!!!!!!!!!!!!!!!!!! ....A LOT OF ATTENTION FOR THE LAST TRACK!!!!!!!!!!!!!!!!!!!!!! !